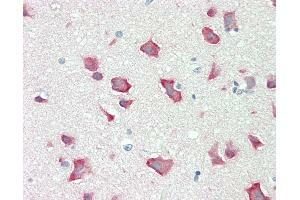 Anti-RPS6KB2 / S6K2 antibody IHC staining of human brain, cortex. Immunohistochemistry of formalin-fixed, paraffin-embedded tissue after heat-induced antigen retrieval. Antibody concentration 5 ug/ml. Specificity Region between residues 300 and 350 of human Ribosomal Protein S6 Kinase, 70kda, polypeptide 2 using the numbering given in entry NP_003943.2 (GeneID 6199).